I tried to adapt my Christmas style to the public. Some link colors were wrong, so I had to change that. I hope it's true everywhere! The style is actually released, however, I could not fix some bugs in the css. This is why I set in here as RC. Note: I removed the header images from the contrib folder. They are free for private and commercial use without attribution. But a direct transfer is definitely not always allowed. Although they are offered everywhere in the net. Last edited by Tastenplayer on Sun Nov 25, 2018 11:57 pm, edited 20 times in total. I was alerted to a stupid mistake. I have updated the download - sorry! by the way are you familar with the Board Announcements Ext? Last edited by Tastenplayer on Mon Oct 01, 2018 9:45 am, edited 1 time in total. I will definitely test the style again in 3.2.2 and submit it for validation. However, there is no hurry with a Christmas style. First, I have to finish the other two styles(Blackfog and Modern with wrap an forabg borders). Styles are almost done. I just have to adjust them in the 3.2.1 Liveboard to test - especially to find css errors! The silver-xmas.css completely rebuilt. Everything has to be in the right place now. Last edited by Tastenplayer on Mon Oct 01, 2018 9:46 am, edited 1 time in total. Download of the Style Version 3.2.2.1 I have updated. 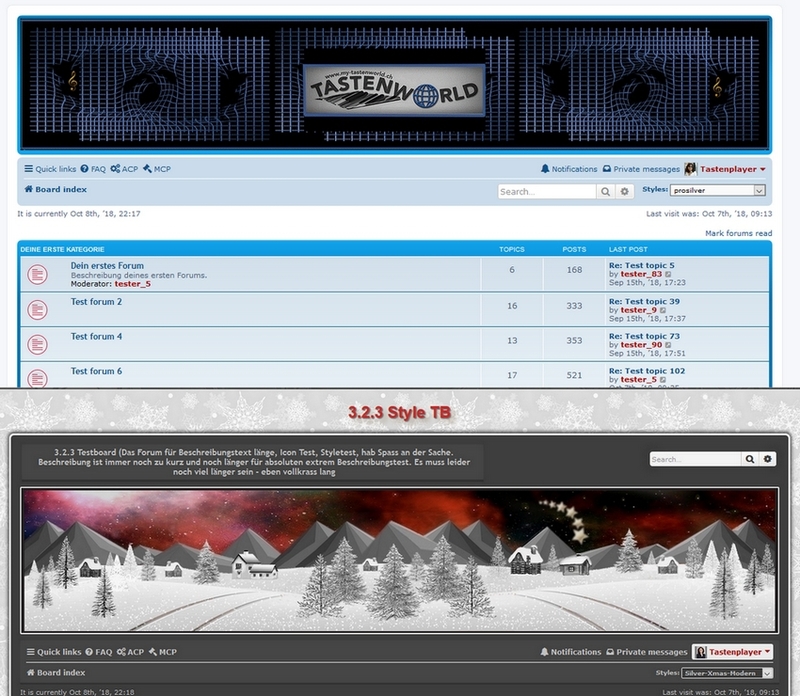 Of course I will submit the style for validation only after the release of the new phpBB version. I changed the header. It is "only" a Christmas style. If you have to change the header as well as the responsive because of a long forum description, for this short time, I find this quite laborious. I think you have to choose one variant instead of adapting both to the new phpbb version. Last edited by Tastenplayer on Mon Oct 01, 2018 10:04 am, edited 1 time in total. It works fine on my computer browser though, any idea what could be causing this? Took forever for this title to display correctly in IE. What an exotic phone you have . I tested the style here http://www.responsive.cc and it looked correct on every display. But if it looks like that in some phones, I'll have to format the title normally again. Unfortunately, I don't have any mobile devices to see if I can do it that way. Too bad about the special title. Maybe I can change the title color in the responsive part? I'll try that. Tried to change that in response. But there was always some browser that didn't display it correctly. Now monochrome with other shadow. Hopefully this problem doesn't also exist in the other styles with the gradient icons! What do the Blackfog and Modern style icons look like in your phone? 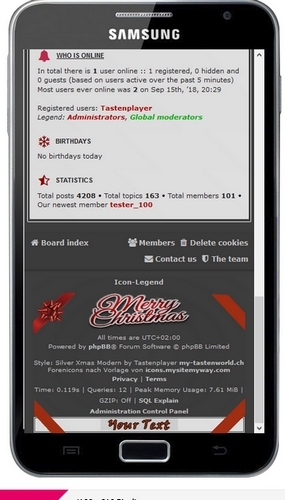 - Changed the online container with background as in ul.forums to make the group colors and member names easier to see. I'm still thinking whether the whole statistics part should be in one block. Because depending on the group color you can't see the member names so well. But I think the style looks better that way. Last edited by Tastenplayer on Mon Oct 01, 2018 10:02 am, edited 1 time in total. I figured it'd have to be a Windows phone. As I had feared, the same problem with the gradient icons in the other styles. Tried all day yesterday to copyright a picture. But somehow nothing fits to the style. I also packed the statistics part into a block. I still like the style better without the block. But now there are no more problems concerning badly readable groups/member colors. Therefore I am quite uncertain, which variant I should make now. The one with the picture in the copyright, I haven't found out yet. In all mobile devices, one sees only the left part. Thanks received code in the post on .de, it has now worked with the images. I liked it less high indeed better. However, there should still be the opposition for a logo or Happy Newyear. Before I can update the download, I have to check the Style.css and the html files again. Last edited by Tastenplayer on Mon Oct 01, 2018 10:11 am, edited 1 time in total. The style is definitely ready now. The whole forum description part and the search headers have been reconfigured. The description is now on the wrap again. There is also an adjustment for the boardannouncement and the Calendar ext. of hjw. However, the background for Saturday and Sunday is not quite satisfactory. Because the style has light as well as dark backgrounds, several extensions need an adjustment, because the font color is not uniform. As soon as I have thoroughly checked the style for correctness again, I submit it for validation. We made adjustments for the validated version 3.2.1 as well as for the version 3.2.2 RC2. Only in the Responsive View, the Search Icon is not displayed in the Navbar. This definitely does not seem to be possible. If someone doesn't have a description displayed in the forum, he can write something like: "We wish everyone a Merry Christmas and a happy New Year" so that there won't be an empty space. Since in the responsive view, no searchbox is displayed in the header anymore. So you don't have to screw around with the Christmas style for a long time, if this Ext. is installed for the other styles in your forum. If someone needs more space for their logo(alternative header image), I created a file with an empty header image background. It also contains gifts and fireworks pictures. Then the Christmas picture will be displayed in this style, despite active extension.